Discussion in 'United's Women's Team' started by Rifer, Oct 13, 2018. That Spurs winner came in the sixth minute of injury time, after a couple of long stoppages on the second half. They do have that habit of digging out results. A good night for us overall in terms of the promotion spots though. Charlton lost 2-0, which gives us a bit of a buffer. In second place with 37 but only 2 points behind Spurs with a game in hand. That GD is insane! They literally scored the same amount of goals as the numbers 1 and 3 combined. And look at Spurs’ goal differance in comparison. They’re like a George Graham team. A lot of late winners from Spurs as well, they really have had an extraordinary season, and the lack of draws makes it even more striking. If the season ends with Spurs and United in the promotion spots I think the FA will be cheering. In WSL1, Yeovil the last of the real minnows, has only 4 points in 15 games. 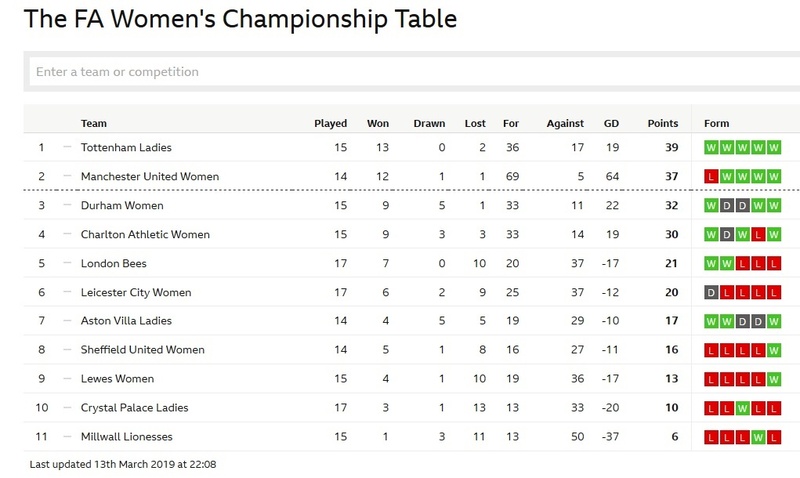 Going pro was always a massive financial stretch for them and I just hope that when (because it doesn't look like an if now) they get relegated they don't face the kind of decision that Doncaster Belles and Sheffield Women had to take and drop out of the semi-pro game as well. It’s coming, Ole is clearly a leaf out of Casey Stoney’s book! United go top and still have a game in hand over Spurs. We play away to Spurs next week and we're very close now to guaranteeing promotion (top two go up). I think Casey will want to win the league. Can't have Spurs actually winning something can we. Away to Spurs next game will be a huge decider. Looking good if we can get something from the Spurs game. 4 points clear with a game in hand.. Which means we are two wins away from promotion and our first trophy.. in our first ever season! Well done, are thry still in the FA Cup? Look at the goal difference!!!!! No, they got knocked out the same weekend the men's team were knocked out by Wolves. Spurs ladies have no drawers this season? The men's team only have one. Think you really need to look at that spelling. 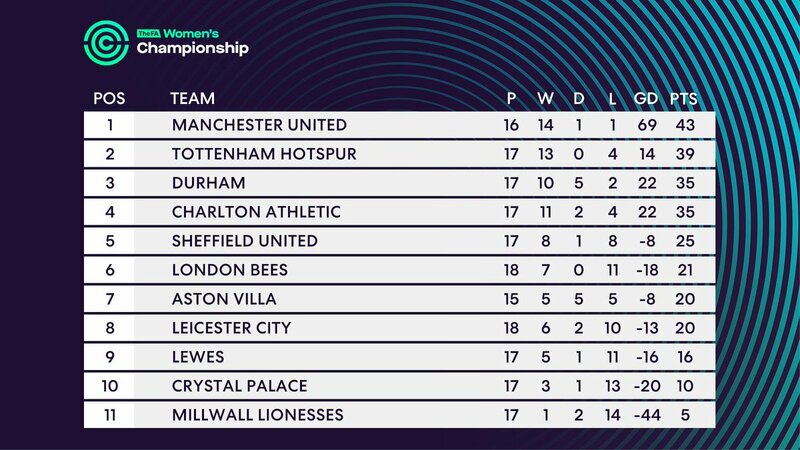 So a couple of weeks back I was saying that our three loanees (Fran Bentley, Naomi Hartley and Ebony Salmon) at Sheffield United had helped Sheffield beat our main rivals, Spurs. Well today it happened again - except this time the United loanees helped Sheffield beat Durham the other team that could interfere with our top spot or promotion place. Durham play Spurs on the last day of the season, but whatever way the sums play out, we're a win away from guaranteed promotion and two wins away from a guaranteed title. Feck You Liverpool. Bring back Santi. Fantastic achievement from the the Women's team. Was hopeful the club would stage one of the final home games at Old Trafford, especially given their achievements, but sadly it doesn't look like happening this season. Would have loved to have gone to a game or too, but as I don't drive, Leigh isn't the easiest place to get to.